Hikers in D.C.'s Rock Creek Park are seeing warning signs and blue patches of ground where the National Park Service is using a herbicide to on the invasive fig buttercup, a plant that sprouts yellow flowers. WASHINGTON – Those who’ve hiked through Rock Creek Park in D.C. this week may have seen signs warning that a herbicide is being sprayed on some invasive plants in the area. The spraying began March 4 and is expected to continue the rest of the week, weather permitting. “That’s just such a bad idea, no matter how you look at it,” says WTOP Garden Editor Mike McGrath. WTOP found some hikers, bird-watchers and horse-riders in Rock Creek park who question the use of chemicals in the park. And a group is circulating a petition to try to stop the spraying. However, the National Park Service says it sprays every spring to weed out invasive plants to maintain the park’s native vegetation. Cindy Cox, deputy superintendent for Rock Creek Park, says this year and last year the park service sprayed to kill the invasive fig buttercup. 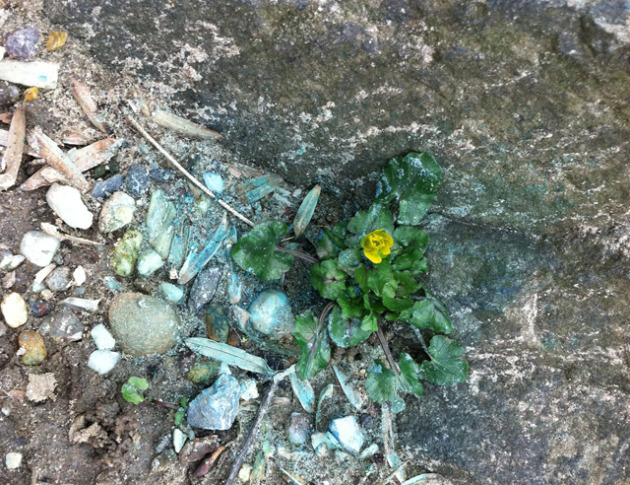 It sprouts yellow flowers. “Exotic vegetation crowds out the native vegetation and hinders it from being able to produce and multiply,” Cox says. “Exotics are really rapid growers, and they’ll use up all the nutrients out of the soil and take over and there won’t be any space for the good guys, so to speak,” she says. The chemical being used to kill the vegetation is “Rodeo,” similar to “Round-Up.” It contains glyphosate as its main ingredient and is more commonly used around water sources. Cox says the spray is safe when it dries and isn’t toxic to humans or mammals. She says a blue dye is put in the herbicide so it’s easy to see exactly where it has been sprayed. She urges people to stay away from those areas and to keep dogs on leashes. McGrath agrees that the herbicide is not toxic to anything but amphibians. But he says toads could fall victim to it since they eat insects. McGrath is most concerned that killing the vegetation will lead to erosion. “There’s nothing to prevent the erosion that occurs at this time of year,” says McGrath. But Cox says resource managers are confident native plants will be able to fill in the void and erosion isn’t a concern. She says the the area will be monitored closely and new vegetation planted, if needed. Cox says she also realizes that people may be worried about chemicals being sprayed where they hike or bike. “However, we are very, very, very careful about spraying around humans, animals and plants,” she says. But some people don’t believe it. There is a continued effort to stop the spraying on a Facebook page that calls for the spraying to stop.